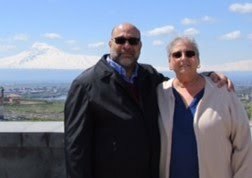 “Dear Armenian friend, I live in upstate New York and cook half as well as my grandmother, Shamiram Basmadjian Barooshian. She taught me great things, though, and I make excellent Tourshi, Basterma, Choereg, Sojouk, Dolma, Lule Kebabs and many other wonderful delights. We have limited access to Armenian or Middle Eastern foods, so when I go to visit my family in the Watertown, MA area, I always go to the Armenian grocery stores. Arax’s Market makes their own Makdous, more of a Syrian treat. I wonder if you can drum up a good recipe for it. I’ve tried making it but it doesn’t have the tangy flavor of Arax’s and of course they won’t share the recipe. I’m 400 miles away – what can I do? Please let me know if you have any success. Thank you so much." Funny she should ask … Doug and I recently stopped for lunch at a little Greek-Middle Eastern eatery in a nearby strip plaza. (Sometimes the best food is found in these tucked-away places.) Lo-and-behold, what did I see in their refrigerated display case? Makdous! I spoke with the owner regarding its preparation, and all he would tell me was that, “it’s a lengthy process”. So, I did a ‘Google’ search and came up with a few recipe options to send Sarah. The makdous preparation which really caught my eye came from Bethany Kehdy at Dirty Kitchen Secrets, a Lebanese food blog. Bethany kindly permitted me to link to her recipe and website for all of you to enjoy. Click here to see Bethany’s step-by-step directions for making makdous – and so much more. Robyn’s note: If you’ll recall, I don’t cook with eggplant or walnuts at home due to Doug’s allergies, so Bethany’s recipe has not been tested in The Armenian Kitchen. However, I can tell just by looking at the the photo that her recipe is a winner! 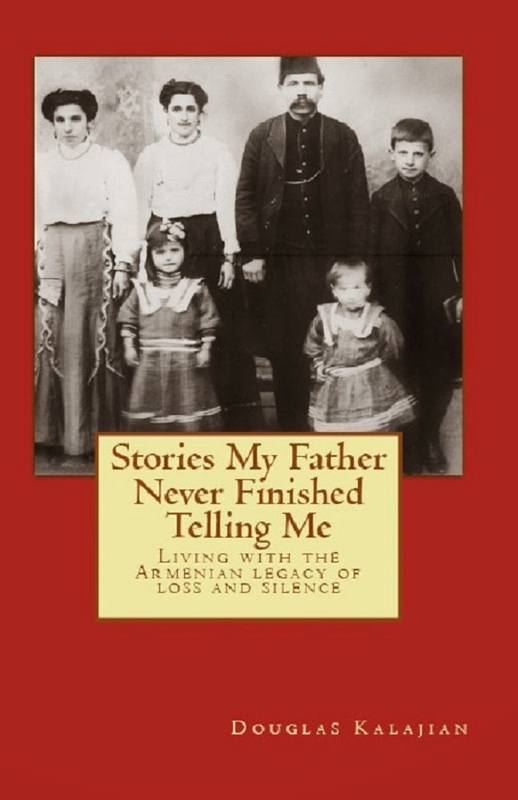 Aline Kamakian's cookbook, "Armenian Cuisine", also has a recipe. How right you are, Ara. 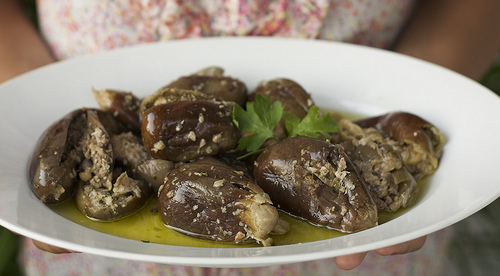 Aline's recipe is listed as 'Stuffed Aubergine in Olive Oil', or 'Engouizov Sempough'.